Tae Bo is an exercise regimen that incorporates elements from Tae Kwon Do and boxing combined with dance movements. It is a system devised and introduced by Tae Kwon Do adept Billy Blanks and has since been brought to millions through videos and classes. 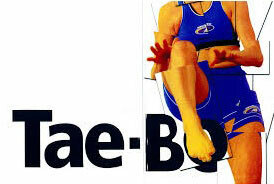 The name Tae Bo comes from the Korean word ‘tae’, meaning foot and leg, and ‘bo’ which is a shortened form of boxing. It is a system of kicks from the martial arts aspect, punches from the boxing and dance moves borrowed from various genres, normally set to music to aid rhythm and coordination. It is designed to be a holistic exercise routine that addresses the mind, body, and soul equally.